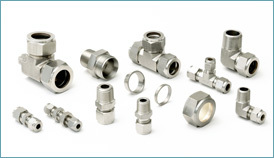 AutomationStore.com is pleased to offer our high quality, Double Ferrule, Stainless Steel Fittings that are interchangeable and inter-mixable with many major brands. Please review our Brass and Stainless Steel compression catalogs in inch and metric at the below links for more information. Standard delivery is 3 weeks, but can be expedited if required.